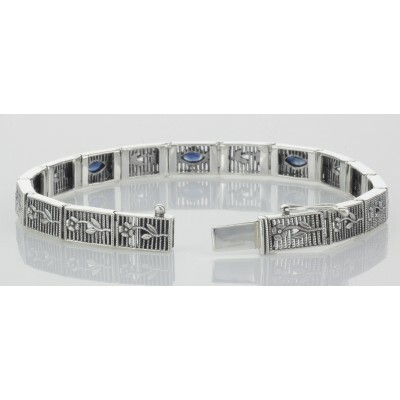 Sterling Silver Sapphire Filigree Link Bracelet w/ Floral Design. 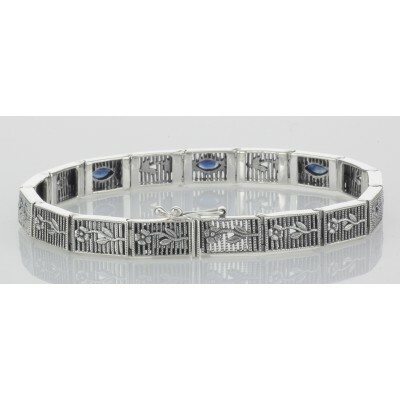 This is a lovely antique victorian styled floral design blue sapphire sterling silver filigree link bracelet. This bracelet features 3 beautiful marquise cut sapphires approx .10 carat each for a total of .30 carats. The floral design is carried all the way around the back. Sapphires are the traditional birthstone for the month of September and also the 45th anniversary stone. Filigree bracelets are timeless in style and can be enjoyed, cherished and handed down as precious family heirlooms. 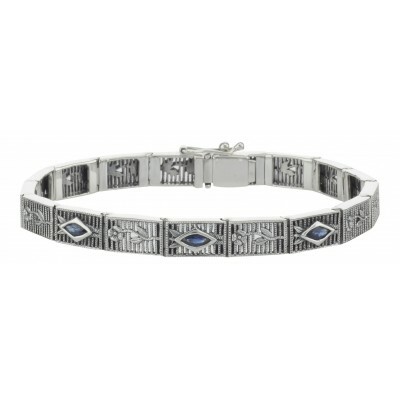 This lovely antique style bangle bracelet would make a perfect gift for many occasions. This bracelet is new and a high quality sterling silver antique and collectible reproduction and comes with a money back guarantee. Please see our nice selection of fine Antique / Art Deco and Victorian style filigree jewelry.